Enjoy a breathtaking view of Rio de Janeiro on this private, 4-hour photography tour. Along with a professional photographer guide, explore a hallmark of Rio de Janeiro. 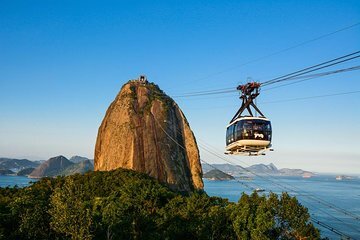 Ride a cable car to the top of Urca Mountain, featuring the beautiful scenery of Botafogo and Guanabara Bay below. Take an optional helicopter ride to escalate the view even more. Then enjoy a panoramic view, including an amazing sunset, from Sugar Loaf Mountain. Afterward, receive a high-resolution digital photo album from the tour and a printed souvenir photo. Hotel pickup and drop-off included.